In an earlier post, I referenced the fact that two of our children will be going back to public school next year. One of my readers asked if I might share how we came to that decision. I definitely can’t go into the nitty-gritty details of why, but I know it must be a question for others. I am literally asking the Lord to show me HOW to do this because homeschooling has been what we do for nearly 5 years now. I am not sure how to start and where to stop. I have alluded to the fact that we’ve been dealing with some issues here in our home, and I have shared before about the difficult journey we’ve found ourselves upon as parents to children from hard places and/or with problematic behaviors. With Valentine’s Day quickly approaching, I thought it would be fun to share a post about ways to share the love with others around you on Valentine’s Day. One thing I’ll promise is that these are EASY things to do! With six children in the mix and mayhem and memories that are made here, I am usually not able to put together anything that requires more than three ingredients … whether it be food or art … or both! These first few photos are from our Valentine Dinner last year. For several years now, Valentine’s Day has been a celebration of our family rather than for just the Prez and me to celebrate LOVE. I will admit that sometimes it would be nice to go out on a date, but our reality is that this is just not a reality right now. 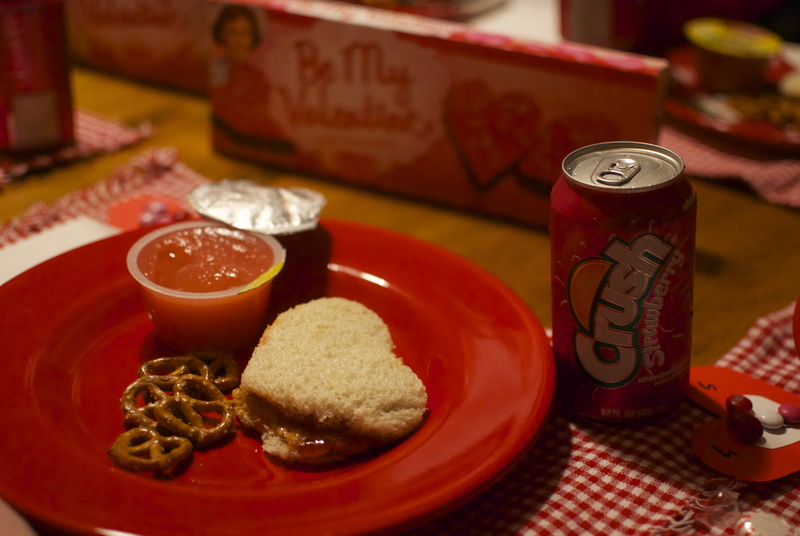 So, I decided several years ago we would start a new Valentine’s Day tradition of having a meal complete with foods I know our kids LOVE, and that have a color theme of red and pink! I love Christmastime. This year though, my heart hurts. I don’t recall a Christmas like this one where I honestly am looking forward to it all being over. If not for my little ones especially, I think I would just skip it. Thankfully, the Prez and some of our children decorated one afternoon while I was gone. I came home and found many things already out. We all decorated the trees together, but a lot of things just haven’t been the same. You see, I had this wonderful dream that this home would be so special because it would be the first home where all eight of us have lived from the beginning TOGETHER. But now, that dream has died because in all honesty so much sorrow has happened here already. The vision I had of this first Christmas in our new home, the one we dreamed of for years, didn’t work out. Since just before Thanksgiving, everything we knew to be true has been clouded with the reality that more was broken here than even we already imagined. I know Christmas isn’t about family times only, far from it, but since 2008 and especially since 2010 it has felt like we are trying to be the family God has brought together through birth and adoption … and we just can’t quite get there. But now I realize I can’t force it. The Prez can’t force it. Sure we are a family, but the roots I had hoped and prayed … oh how we’ve prayed (yet people will say “if you just pray”) would develop … so many of them that appeared to be there were not rooted as I thought and then others … have never taken root. I love all of our children so deeply, and that is why it hurts so much I think. When our children war against one another in one form or another, oh how it breaks a Momma’s heart. I don’t know about anyone else, but if you like me, have dreams that have been dashed, a heart that feels like it has been broken in multiple places, a home that just is filled with reminders of all that is broken, a grief that seems almost too much to bear ... just keep holding tight to Jesus and never, never let go. If you are suffering from a broken heart, maybe one or both of these songs will be a blessing to you. I do sincerely wish you a Merry Christmas. May 2014 be filled to overflowing with HOPE for you. I know I’m hopeful for the sun to rise and I will continue believing in Jesus’ promises, particularly that His mercies are new every morning. Do You Have Child with ADHD? I used to think all sorts of things about ADHD. Maybe you did. Or maybe you still do. Doesn’t really matter to me or my son or anyone else with ADHD. What does matter is that if you are the parent of a child with ADHD, I understand. Is yours the one at the grocery store who is cussing you out because you said no to the soda or the candy? Is yours the one who tells you for the 10th time in a day that he wishes some type of harm would befall you? Is yours the one who struggles every day to complete simple tasks that to most of us are just second-nature? Or maybe your child spends more time and energy refusing to feed the animals than it would take to just do the work? While I had hoped to do some school updates, life has gotten too busy for that. Life is full of twists and turns. I am so thankful we can’t see into the future. If I had known the trials our family would be enduring at present a few years ago, I’m sure I would have made different decisions. However I’m sure of this: we have walked out God’s call to adopt each of our children and we have trusted Him to lead us in that. Maybe someone reading needs to read this quote today. Surely all have heard of Corrie Ten Boom, but if not goo*gle her because knowing her story gives the quote its power.